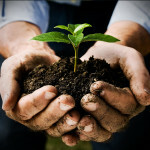 Having a beautiful garden is all about patience and a great amount of hard work. In addition to choosing the color burst of flowers, planting them and decorating the garden with everything you can think of, you need to make sure it is well-groomed, healthy and leaf-free. In this regard, you may need to use various tools in order to clean it throughout the seasons. What do you do when the back yard is filled with leaves and your time is limited? If your gardening tools arsenal contains a leaf vacuum/blower, it’s really easy to handle this task. Such device can feature either an air-suction or blower function, acting as a giant vacuum cleaner of natural debris. The market is packed with various such machines and you have plenty of options to choose from. Starting with the engine, the feeding hole and ending with design and ergonomics. 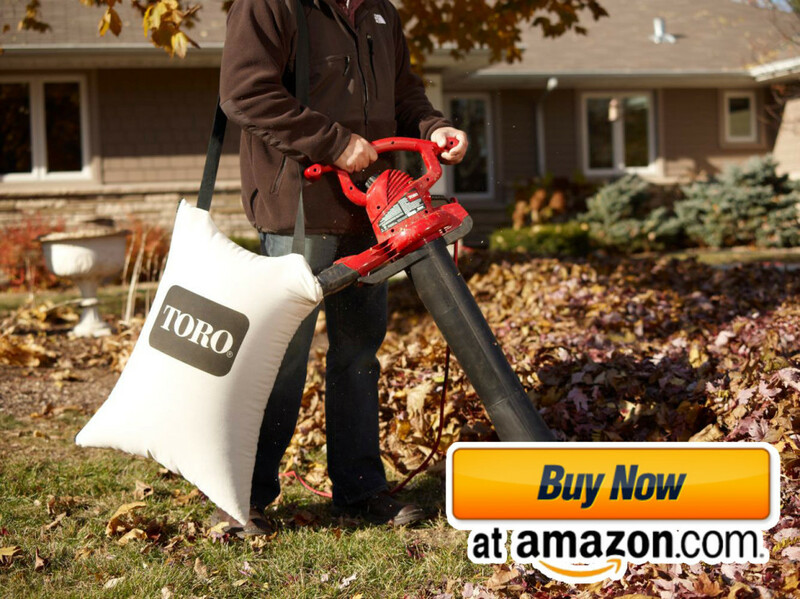 This light mechanic leaf vacuum mulcher was designed and created by Toro and it is the perfect choice for those who need something cheap and reliable. The mulcher has 3 functions: blow, vacuum, and leaf shredder that works great for all situations. The variable speed of the rugged metal impeller gathers and mulches the debris into fine dust. This vacuum mulcher blows @ 255 cfm and the vac mode is set @ 410 cfm. This commercial leaf mulcher is an upgraded version to the previous Toro 51609 Ultra so you can expect enhanced performance and better mulch compression. 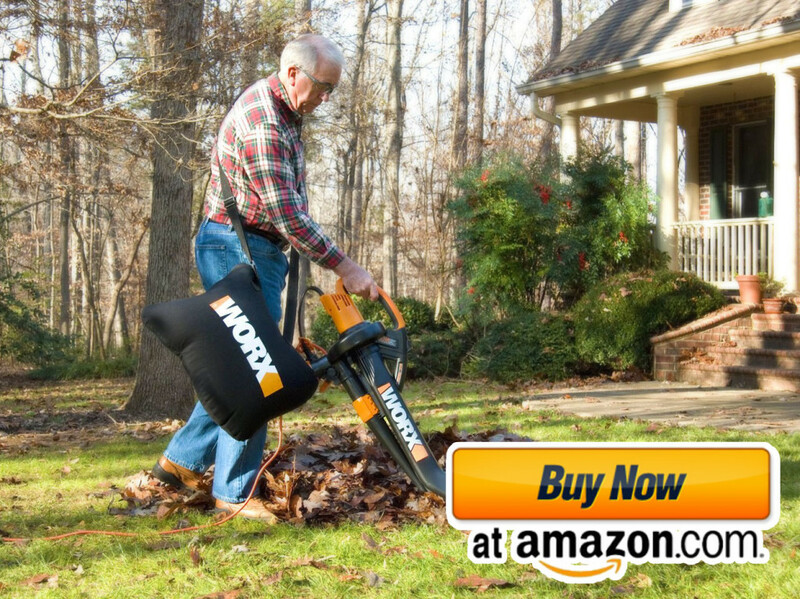 Worx is well established in the Yard & DIY Tools community and they have been producing great portable leaf vacuums for some time now. The image above is representative for this particular gardening tool, since you can get a clear idea on its main advantage: this leaf vacuum device can be manipulated with ease by anyone, even by a senior. There is also a blow function that works like a charm, but you can also use the switch and set it back to vacuum mode. The bagging ratio is somewhere between 8 to 1 and 12 to 1, so it’s the perfect choice if you plan to clean larger areas. Worx Trivac WG500 weights 8.4 lbs. Lightweight and well-balanced, it can be operated single-handledly thanks to the 6 position switch. Up to 18 to 1 ratio of fine mulch. 3 in 1: vacuum, blower and mulcher. Electric, there’s no need to fill it with gas. 210 MPH / 350 CFM adjustable air flow. The box contains a 1.2 bushel capacity collection bag for vacuum mode. Wet or moist leaves tend to stick inside the propeller. The On/Off switch feels difficult to engage especially with a pair of gloves. While we get on a higher position in our list, we find this gas powered mulcher that represents the perfect solution for larger areas like a mini-golf course, tennis court or a large public garden. Although the price is not as cheap as the other devices in the list, you will learn that all the reviewers were pleased with this product. The leaf mulcher can clean a wide 24-inch path in a single pass, so it’s more effective than the previous devices and… Billy Goat KV600 is portable. You don’t need to worry about fallen branches, since this powerful machine will shred them in no time without any problems. The blower function is just as reliable as the vacuum one, and you will probably need to take a step back when you will activate it for the first time. The company that built this leaf vacuum has a 40 year legacy in the field. Compared to other machines in this list, this one can handle small branches. The large 5 blade impeller is well constructed and durable. Can handle even wet leaves. The path is wide which makes it perfectly for large gardens. The pull is a bit heavy, starting for the first time can be a little tricky. Once the bag gets full of mulched leaves, it may be a bit difficult to handle. 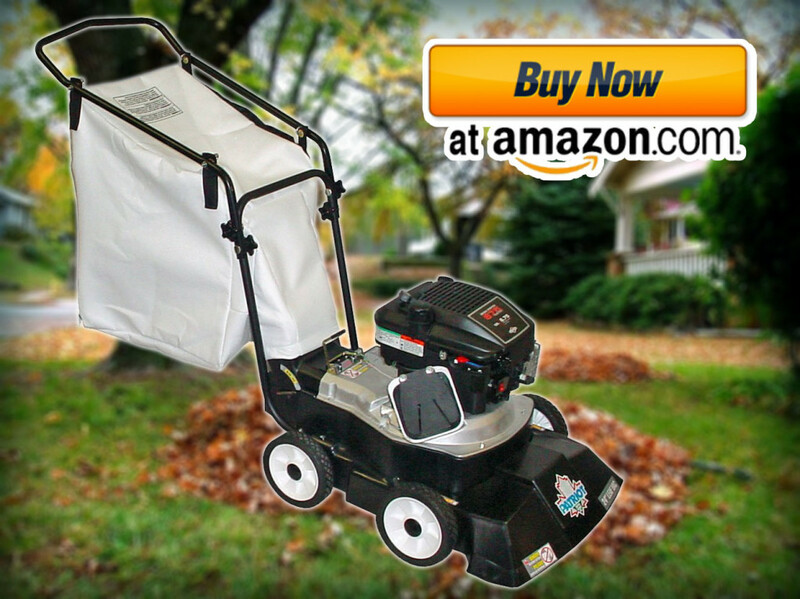 This is the ultimate leaf vacuum mulcher capable of chopping everything that’s in its way. 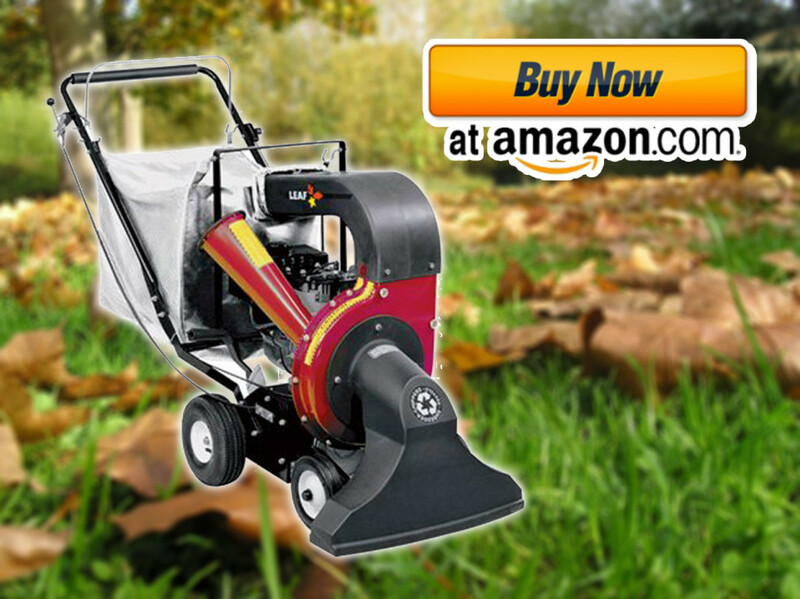 The 80-mph powerful suction is able to gather all the leaves, grass clippings and additional lawn debris that you may encounter in your way. One reviewer said that after 7 years of using Merry Mac Walk-Behind, it’s still new and reliable. So, if you do decide to buy this one, you can expect to use it for at least 5 seasons. It’s the perfect choice for larger projects. Self propelled. 3 forward speeds plus reverse. The path is 25 inch wide which makes it perfectly for large gardens. Manual starter; sometimes it can be difficult to start. It features an entry level engine. The last device from our list is an electric corded hand held leaf vacuum mulcher from Black & Decker. You should probably be happy to learn that, at the moment I am writing these words, it is the cheapest from the list and it is packed with attractive features. The manufacturer brags on the fact that it is 50% quieter than the previous model and can reach air velocity speeds up to 250 mph. Furthermore, compared to the previous models, this one is made from better and durable plastic. It also packs a built-in cord retainer and a collection bag. If you decide to buy Black & Decker BV6000 then you should know that it can handle leaves, twigs, grass clippings, pine needles and various lawn debris. 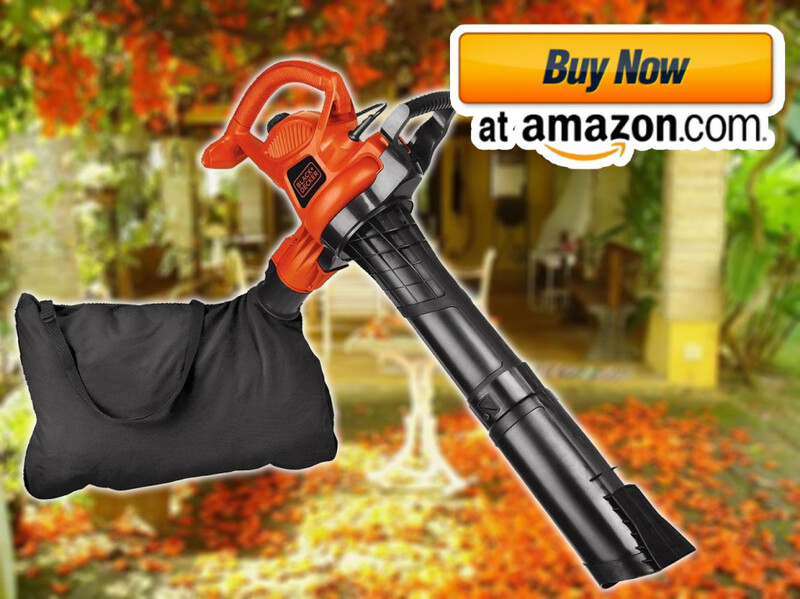 Thanks to its all in one function, you can use it as a blower, a vacuum or a leaf mulcher. When in vac mode, the flow of air blows close to your face. With all these features that are available, it may get quite difficult to choose the device that best suits you. Some people use as a decisive factor the amount of leaves that accumulate periodically around the house and the size of the courtyard. 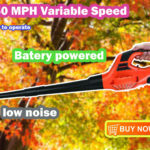 But even so, few people know where to find leaf blowers with all the specs needed at a good price. 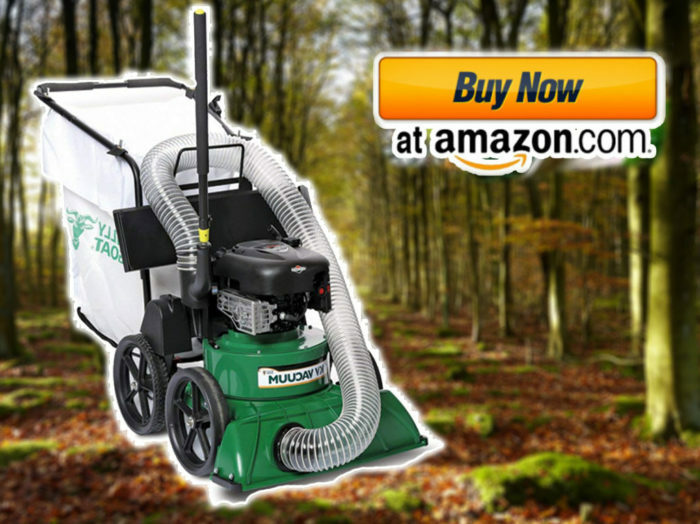 To cover all of these adjacent topics, we have compiled this shopping guide, explaining briefly the most emblematic capabilities of the best leaf vacuum on the market. The engine can be gas-powered or electric. If it is going to be used in public areas or in areas where there is no electrical power, a gas-powered blower is the best choice. The advantage is large autonomy, mainly since it is not depending on a fixed energy source. The gas engine used in these machines is robust and powerful enough to provide frequent use without premature wear. The same selecting criteria should be applied by owners of large yards, where large amounts of leaves accumulate more often. For those who use the device occasionally, for limited areas, we recommend an electric leaf blower. You will be able to find enough affordable products that can generate 2500W of power, which is really good in terms of efficiency. Are you focused on the money you will spend operating the device? In this case you should probably opt for an electrical vacuum mulcher, but do not forget to check the length of the power cord and the thickness of the extension cord. For domestic use, a device with an electric motor is perfect. If you want a bigger gun, you will probably have to go for a gas-powered machine. Selecting the perfect mulcher depends on the configuration of your garden. There are wheeled blowers, backpacks and handheld models. 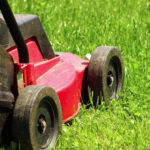 Large amounts of leaves should be processed by self propelled machines, which have a configuration similar to that of a lawn mower. Most of them feature a very powerful gas-powered engine, placed behind a ventilation pad. Don’t forget that these devices are usually large and they need more storage space. Also, their engines needs to be maintained every once in a while. If you have a medium yard that accumulates reasonable amounts of natural debris, you will be better with a handheld vacuum mulcher. It will meet all the challenges without any problems and it does not need much technical knowledge from your part. Regardless of what you decide to buy (a commercial leaf vacuum or a home use device), it must offer the option to adjust the air jet and / or suction speed. It should also feature a fast on / off button for unwanted scenarios. It’s obvious that you will use it at various speeds. Depending on the debris, the job may require a stronger flow of air. Make sure all these are included in the machine you select. The following aspects are to be accounted if you want to buy an ergonomic and easy-to-operate machine: engine air vent, the way it is handled, shoulder strap, suction / blow nozzle shape, the storage volume of the collection bag. Be sure to decide on a model that has the ventilation slots located in the rear, opposite to the nozzle. You don’t want the engine exhaust to be felt by the user’s clothes. A soft rubber grip is much appreciated. Some models even offer a main handle and a control handle. There are two types of nozzles: circular and flat. Keep in mind that the flat is useful to more accurately direct the flow of air and leaves, and the circular one provides more airflow power and is used when you want to remove the dead leave remains attached to grass / soil. If you want to buy a self-propelled vacuum mulcher, make sure the suction path has at least 24 inch. These are not the only leaf mulchers, vacuums and blowers that you can find on the market in 2017, but they are among the best money can buy. I hope that this article offers a clear idea on what you need and how much money you should spend on such a device. Just remember that if the mulcher you are planning to buy is electric, you will also need a long electric power cord and maybe a storage reel with stand in order to work with it properly. If you plan to use the leaf vacuum mulcher for larger areas (like a huge lawn or for a golf course), then you should probably get a large vacuum mulcher that is powered by gas. Oh, and buy a pair a gloves and protective glasses. Safety is really important, right?